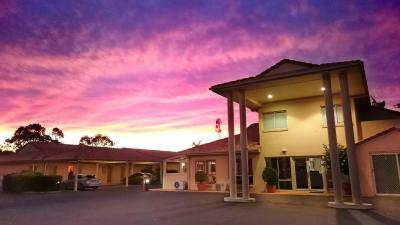 Lock in a great price for Country Roads Motor Inn – rated 8.6 by recent guests! I would highly recommend the County Roads Motel. Friendly staff, very clean room , comfy beds and plenty of under cover parking. Very comfortable room. Heaps of space and good shower!! Also the room service was 10/10. Thank you for allowing us to come late and still be met personally. Great service from staff. Undercover parking; location of car to room; permitted by staff to wash bugs etc from car. very well presented ; very clean. It was as advertised. Food was awesome, staff are friendly and outgoing, free WiFi is very reliable and very fast, location is very convenient with McDonalds, Subway, Fuel station and car wash close by. Rooms are spotless and comfy. Highly recommend. Very convenient location with amazing staff and restaurant meal wonderful. Really big rooms and plenty of space to stretch out. Country Roads Motor Inn This rating is a reflection of how the property compares to the industry standard when it comes to price, facilities and services available. It's based on a self-evaluation by the property. Use this rating to help choose your stay! Offering a restaurant, bar and swimming pool, Country Roads Motor Inn is located in Goondiwindi, 3 minutes’ drive from the National Heritage and Water Park. Free WiFi access is available. Enjoy a meal at the Restaurant, offering a great dinner menu including char grilled steak and barramundi, roast lamb and sticky date pudding. BBQ facilities and a room service menu is also offered. Country Roads Motor Inn Goondiwindi is 5 minutes’ drive from Goondiwindi Hospital and 8 minutes’ drive from Goondiwindi Golf Club. Spend a relaxing afternoon at the Botanical Gardens, only 10 minutes’ drive away. Each air-conditioned room has flat-screen satellite TV, an electric kettle and a refrigerator. Ironing facilities and a private bathroom with a hairdryer is standard in all rooms. When would you like to stay at Country Roads Motor Inn? Offering disability access, this air-conditioned room has flat-screen satellite TV, an electric kettle and a refrigerator. Ironing facilities and a private bathroom with a hairdryer is available. This air-conditioned room has flat-screen satellite TV, an electric kettle and a refrigerator. Ironing facilities and a private bathroom with a hairdryer is available. House Rules Country Roads Motor Inn takes special requests – add in the next step! One child under 12 years is charged AUD 10 per night when using existing beds. Country Roads Motor Inn accepts these cards and reserves the right to temporarily hold an amount prior to arrival. If you expect to arrive outside reception opening hours, please inform Country Roads Motor Inn in advance, using the contact details found on the booking confirmation. Bathroom door didn’t lock shut. Lovely clean room. Comfy bed. The noise from the trucks is constant. It was neat and very clean. The shower was great. It was great, beds were very comfortable and the unit we had was really quiet. The service was outstanding as we were arriving after hours at night and the owner turned on our air-conditioner, left the ensuite light on, put some milk in the fridge for us and left it open so we could go straight in and go to bed, he was great. We just fixed it up on our way out in the morning. The position of the motel was great as it was right on the highway we were travelling down. Fantastic. We most likely stay there again on our way through. Great location, staff are a pleasure to deal with. All over great place to stay! The location was great and the owner was a barrel of laughs. The service was excellent. It was spotlessly clean. Staff were friendly. Spacious rooms.